When we were designing the study area for the kids, I drew up cupboards that formed a T-shape and the hubby was the one who then suggested "Why not let's make it into a tree? ", which sounded like an excellent suggestion. Yet, it was easier said than done. 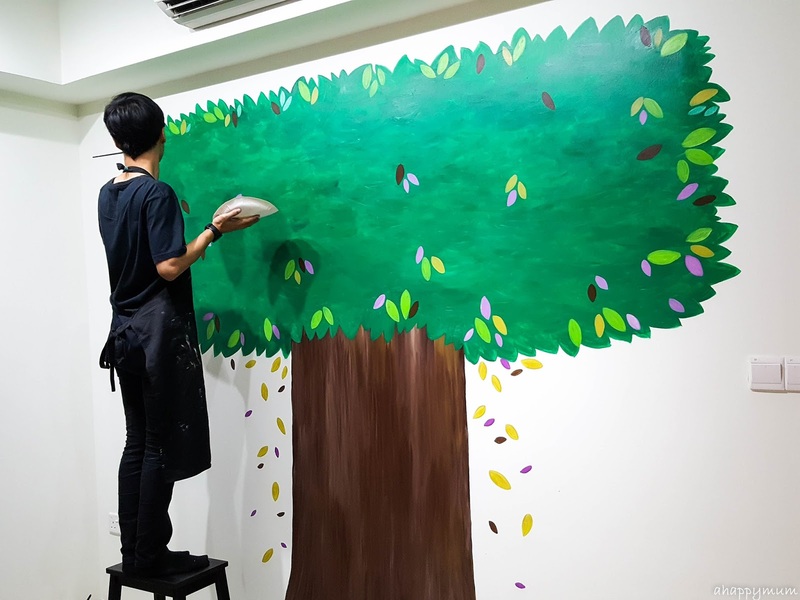 We came up with ways to make a tree-like structure, we searched for furniture pieces that resembled a tree before we decided that the best way would be to paint a backdrop of a tree and then do a customised cupboard with shelves to represent the tree trunk and branches. We asked if our painters could help us to paint an outline of a tree but alas they couldn't. We thought of painting it ourselves but couldn't imagine if it would turn out the way we wanted it to be. So after a few weeks of feeling at a loss yet determined to press on with the idea, you bet I was very much relieved when the kind teachers at heART Studio said that they could do us the favour and pop by our new house to paint with the girls. 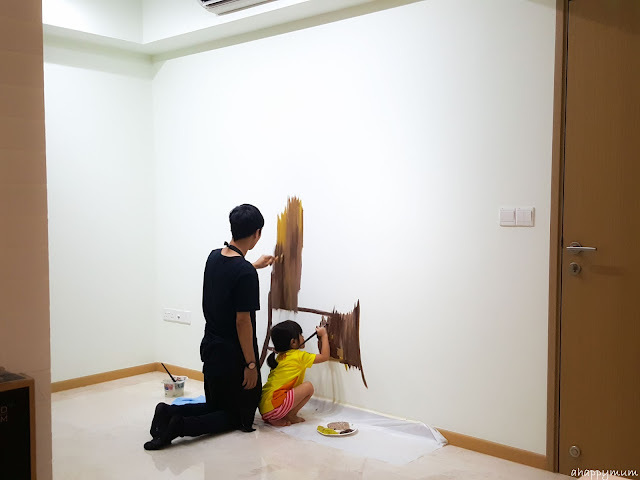 So, you have already seen the wall mural of the beautiful Singapore skyline that Angel painted together with Teacher Elma. 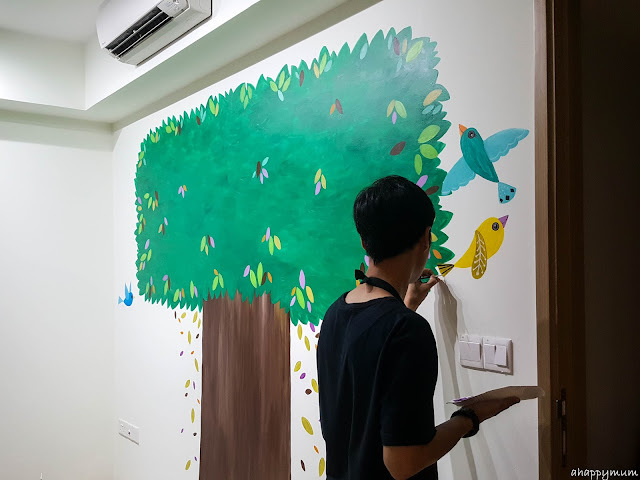 Today, I'm sharing about the tree that Ariel painted with Teacher Syafiq which I call the Tree of Knowledge because it will be our library corner and house all our books in future. 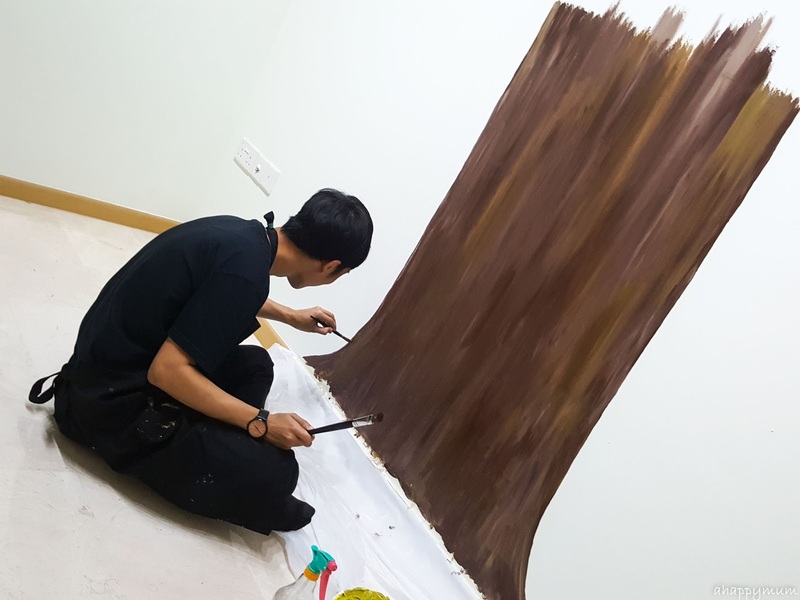 To start off, Teacher Syafiq mixed a few different shades of brown/yellowish colours for the tree trunk and the painting began. We had a huge wall of 3m long by 2.4m tall to cover and you can imagine the time and effort that went into it. The little girl couldn't wait to get started! 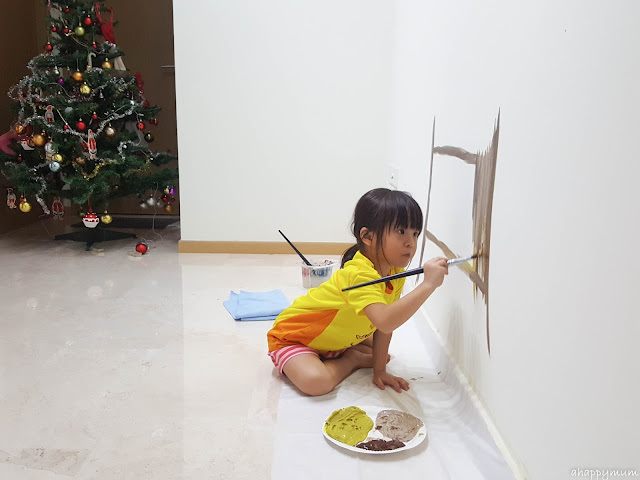 She's been taking art classes for a year now and to be honest, I was initially worried if she would like and enjoy it as much as the sister does since I know jolly well that their interests might be diverse. 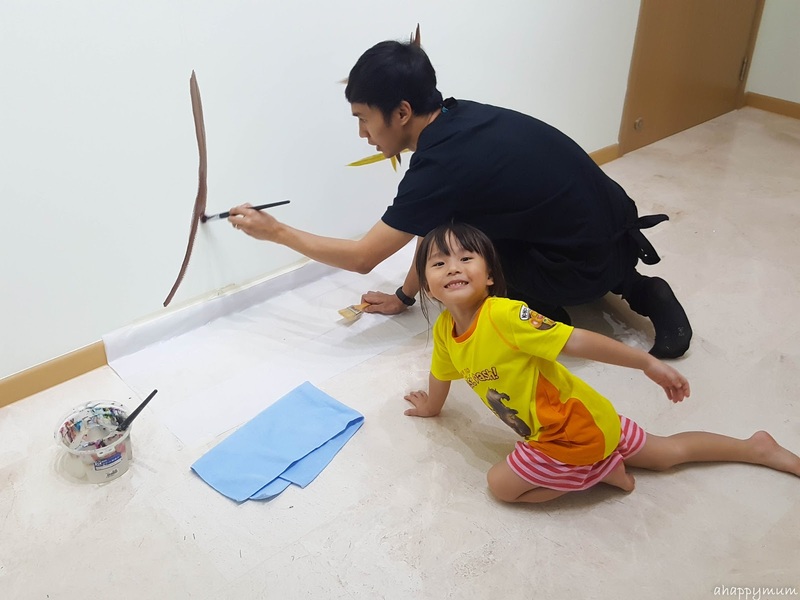 It turned out that she's been looking forward to Teacher Syafiq's lessons and even though she doesn't speak up much in class, she comes home telling me "I love painting!" which is really heartening to hear. There she goes! 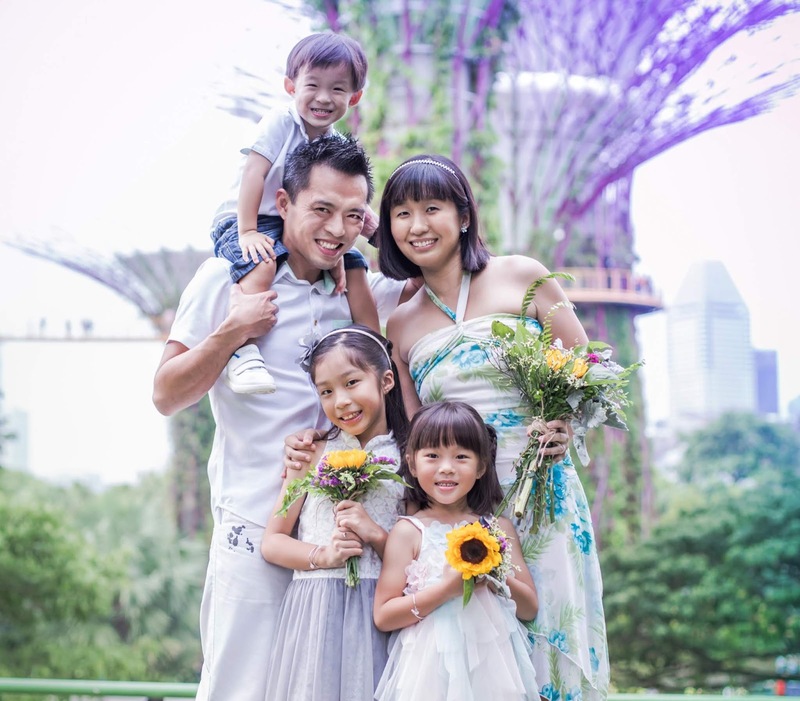 This four-year-old was as enthusiastic as could be as she began to add colour to the trunk. She had to hop the paintbrush and keep changing colours, which I must say was quite tiring and furthermore, the trunk was huge and wide! I love this picture of the teacher-student pair working side by side and I know how precious it will be when we look back next time. 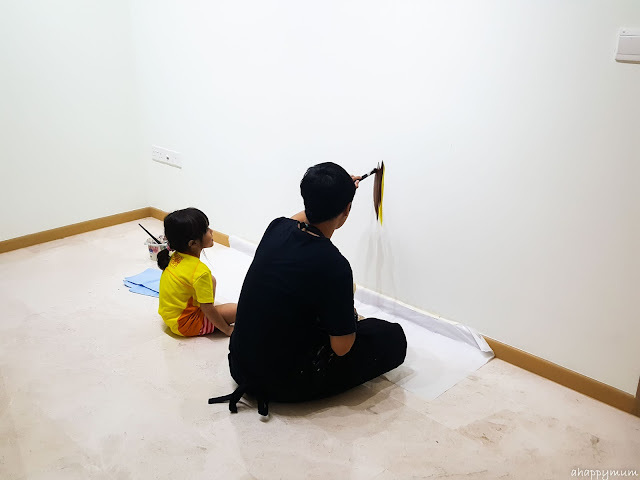 I mean, when do you get such a golden opportunity to paint on the walls of your new nest with your very own teacher, right? Despite the fact that Ariel probably only covered less than 10% of the entire tree, the fact was she knew she did her utmost to be involved and she did play a role in painting this gigantic tree. That was what mattered to me. See how the different shades blend together eventually and make the tree trunk appear more layered and realistic looking? Quite amazing, right? Oh, the reason why I needed a very wide trunk was because this will be the kids' library and I wanted it to contain as many books as possible. I'll be showing you how it looks after the customised furniture is up in our study area tour, so do keep a lookout for that! 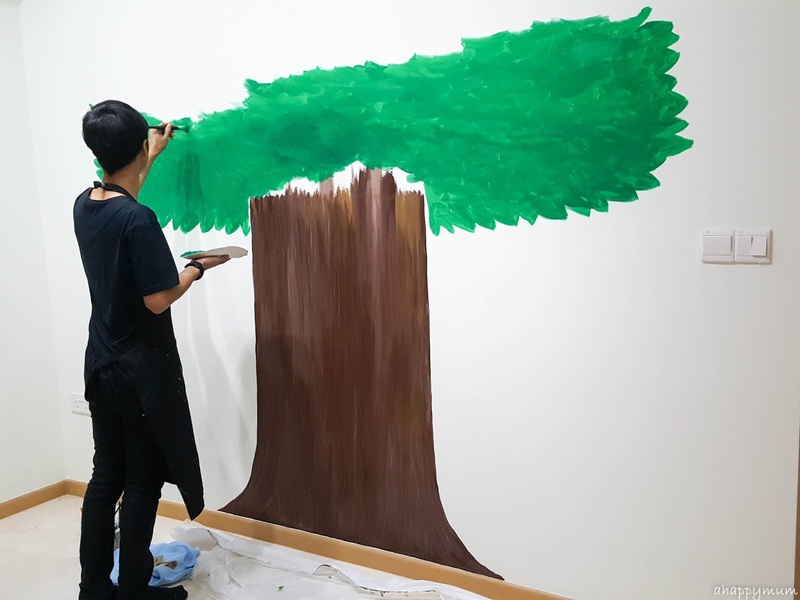 Once the tree trunk was done, Teacher Syafiq moved on to paint the canopy. Likewise, we needed a huge, wide canopy so as to be able to accommodate more shelves for our books and so he worked within the dimensions we provided. 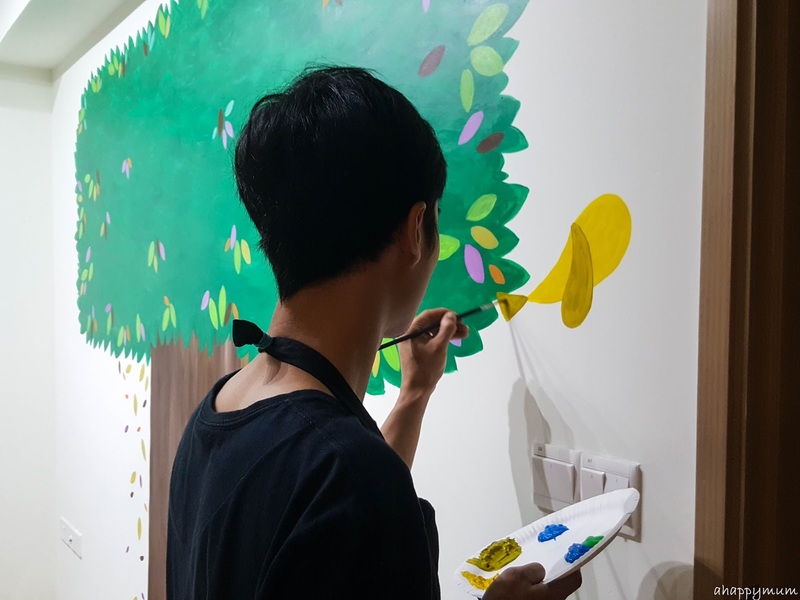 Another way he tried to involve the kids was by asking them for the colours of the leaves they wanted and how they want the leaves to be placed. Angel chose to have falling leaves which I thought made it very scenic! 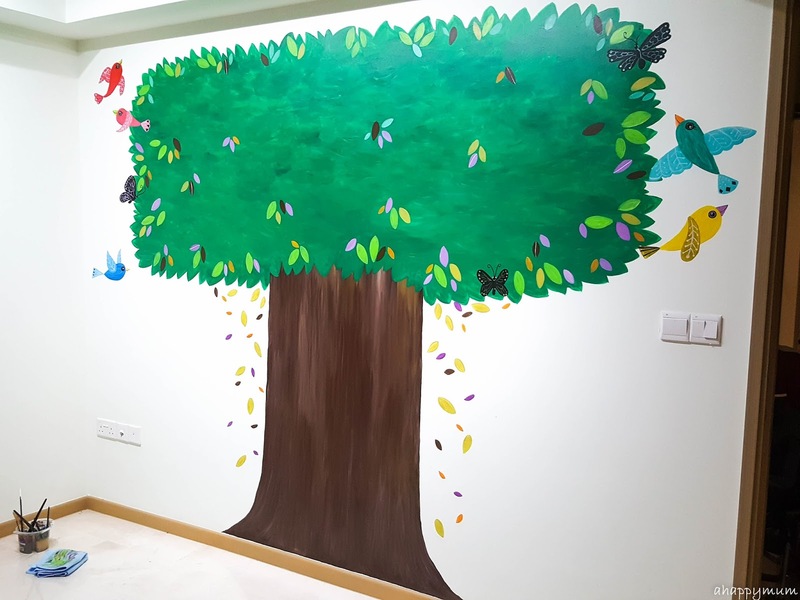 We left the middle portion of the tree more bare because it would be covered by the shelves and books anyway, but for the border, Teacher Syafiq made it really beautiful with the leaves and he even added in a family of birds and some butterflies too! There was going to be a total of five birds, one to represent each of us, and we got to choose our own colour. The hubby chose yellow, I went for turquoise, Angel wanted pink, Ariel had red and we chose a blue for the baby boy. The birds looked so lovely after Teacher Syafiq added in the details and if you look closely, the wings had patterns on them and the female birds even had eyelashes! How meticulous, right? I love how the black butterflies contrasted the multi-coloured hues of the birds and leaves too. So, after one whole afternoon and evening of hard work, we were all done with the murals and here's our completed tree! I know I know, the trunk is a little wide and the canopy is oblong, but wait till we put up the cupboard and shelves and you'll see! Stay tuned! **This is not a sponsored post and the art teachers did this for us purely out of goodwill and friendship. 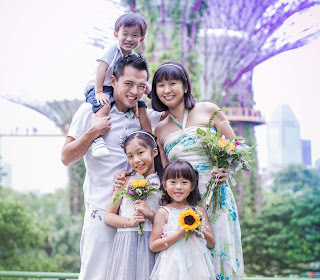 If your kids are keen to pick up art as well, do check out http://heartstudiosg.com/ and get to know more about the awesome teachers there. It's definitely a great place for the little ones to learn about art, be creative and enjoy at the same time.